1. It's getting hot up in here. We had our first few consecutive days over 100 degrees. That means pool season is in full effect. I think I will be able to enjoy my pool a whole lot more this year than I ever have before. I mean a quick swim is good for a study break right? Of course that's after I apply SPF. 3. I relate this phrase to my Mom's journey as well and I tell her, just keep swimming. She's almost to the end of this nightmare. Since I wrote last, she completed her 1st 3 rounds of chemo and then had about 4 weeks off before she started 5.5 weeks of radiation (28 treatments!). She went to the same place at the same time M-F for 5.5 weeks. How monotonous does that sound? Come last Thursday Mom was ever so happy to NOT visit that place! She has now successfully completed radiation. Another milestone reached as she gets closer to the finish line. What's next? 3 more rounds of chemo. I can only hope her side effects are better and definitely not worse than they were the 1st 3 rounds. Some neuropathy (nerve pain in her lower extremity), extreme weakness/fatigue, fuzziness, an "out of it" feeling, nausea, hot/cold flashes (no, it's not menopause! ), chemo cough and well just a really bad hangover for a few days was what she experienced in a nutshell. (Hope I explained that right Ma!) Chemo is no joke I tell you. It is definitely NOT fun. I am sure she is more than ready to put these next 3 treatments behind her and get her strength back. Although she rocks the bald head as good as I did (and maybe better) I'm pretty sure she's ready to have some hair back on her head too! But, what better time of year to have a bald head... So Mom, just keep on swimming, you are almost there!!! 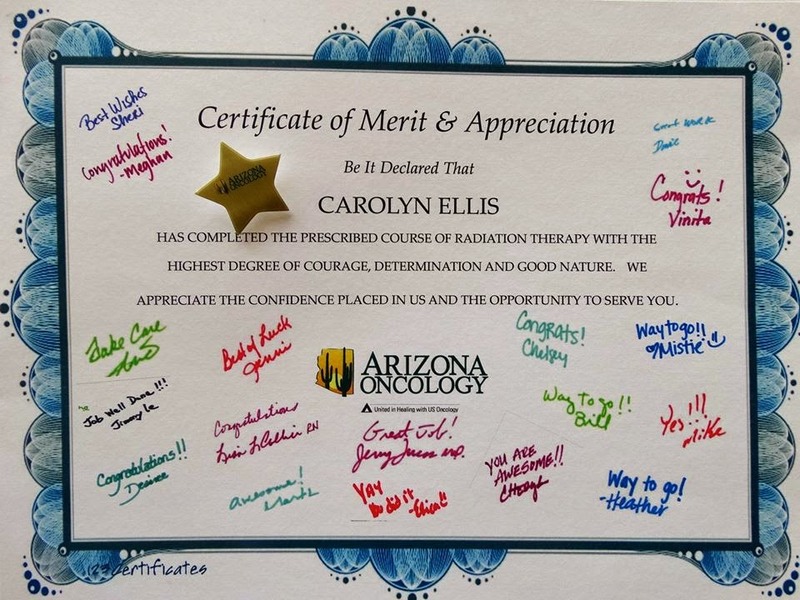 PS: Here is my Mom's radiation graduation certificate!! !